Topics: Crystal Awards, Glass Awards, Marble Awards, Acrylic Awards, and Plaques. 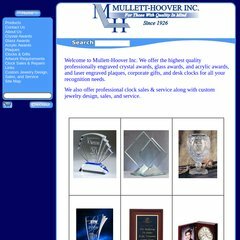 mulletthoover.com Missionary Plaque - 502 - Quality Custom Engraved Awards, Crystal .. It is hosted by Fibernet Corporation (Utah, Orem,) using Apache/2 web server. There are 5 DNS records, such as dns3.name-services.com, dns4.name-services.com, and dns5.name-services.com. Its local IP address is 209.90.78.77. PING (209.90.78.77) 56(84) bytes of data. A ping speed test response, is timed at 49.9 ms.